Move along, there’s nothing to see here, folks! 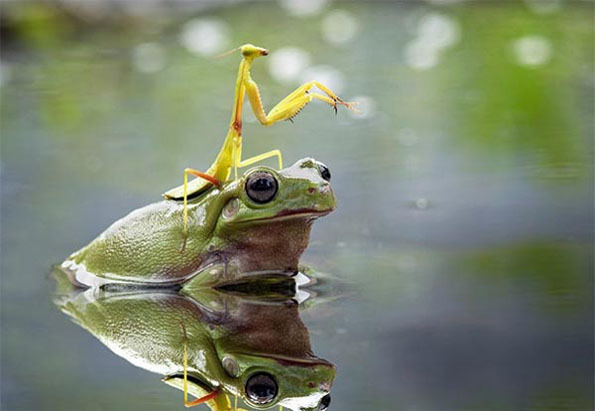 Just a praying mantis riding a frog is all. The photo was taken by photographer Nordin Seruvan in the pond in his back yard. Well check out Mr. Fancy Pants over here! Duder’s got a house with a yard, a pond with praying mantises riding frogs, AND a camera for taking pictures! Now I know what you’re thinking and the answer is no, actually, not everyone has a camera. I don’t have a camera. Not even on my phone. Because I don’t even have a phone! I have a beeper. And the batteries are dead. Man, now that I think about it, my life totally blows. Where did I go wrong? !